MOTHER. I AM GOING is a three-screen audio-visual installation. Filmed in an abandoned village in southern Bulgaria, and on the North East coast of England, the film weaves together documentary, performance and archive footage to explore memory’s relationship to the cinematic image, and the discontinuity of history. Lucidity appears only in brief moments and no final truth is ever revealed. The three screens are erected around a hand-built, scale-model island that sits in a tank of dark, flowing water, reflecting the flickering light of the screens. This island and its single house appear within the film itself. Special thanks to our Kickstarter backers, Crescent Arts, Stuart Cameron, Christopher Ellis, Gareth Evans, Lara Goodband, Geraldine Malone, and Tsarino Foundation. “MOTHER. 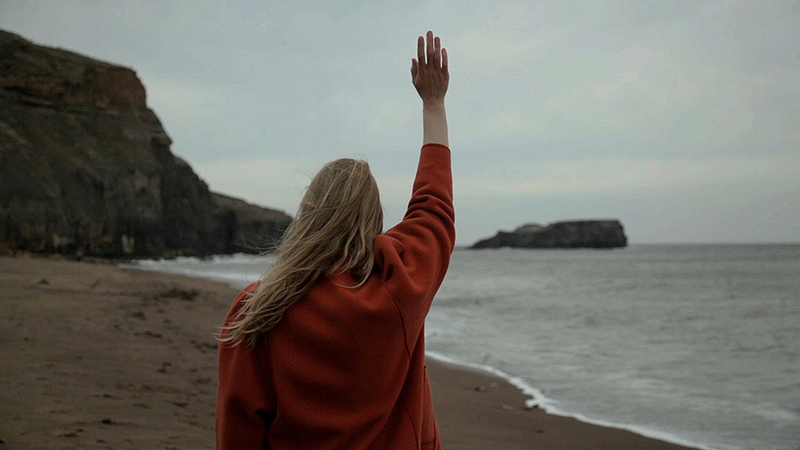 I AM GOING, by the British/Canadian artist-filmmakers Caitlin and Andrew Webb-Ellis was one of the highlights of our installations strand of Alchemy Film and Moving Image Festival 2015. Brilliantly executed and produced to an exceptionally high standard, this installation is a rigorous, deeply thoughtful and visually compelling meditation on the uncertainty of memory, mirrored within the ambiguous territories the film-installation inhabits. “During the time that Mother. I am Going was exhibited at the UK Young Artists Leicester Festival 2014, audiences were captivated by Webb-Ellis’ impressive installation. The work was immersive, intelligent and beautiful and we were extremely proud to showcase it as a highlight of the weekend. Estuary Festival – 17th-30th September 2016. Alchemy Film and Moving Image Festival, 16th-19th April 2015. The Tetley as part of Leeds International Film Festival, 14th – 23rd of November 2014. With an ‘in conversation’ event with curator Stuart Cameron on 19th November 2014. UK Young Artists Leicester Festival – 7th-9th of November 2014. The point of departure for ‘Mother. I am Going’ is an old 8mm film of the artist’s mother as a child. The film shows her playing with her sister on a beach in the North East of England. The site of this recording is the nexus around which the film revolves. ‘Mother. I am Going’ investigates ideas of authenticity and ‘the original’ in relation to the photographic image. Across three screens, the hand of the artist sketches a sort of map, constructing a collaged narrative that draws together events separated by location and time, yet brought together by chance associations. The work reveals the story of its own making, in which coincidence and fiction play as significant a role as any rational account of historical events. The development of this project, and much of the filming took place in an abandoned village in Bulgaria. This place is a significant site of investigation for Webb-Ellis. The houses in the village are deserted; yet carry the traces of the previous inhabitants and their withdrawal shortly before the fall of Communism. The village has been removed from present-day maps. The village embodies the concept of memory and the process of forgetting. Its complex history becomes intermingled with the artist’s own difficult family history: the loss of his mother in childhood, and the subsequent loss of his memories of her. The film links biography with wider historical events. A series of connecting dots stretch back through time, some dots more prominent than others. We make our own constellations. The artist’s grandmother, who filmed the 8mm images on the beach, is now in the late stages of dementia: she is central to, yet absent from, the film itself. In her childhood home, she said, survivors from the hospital ship, Rohilla, were sheltered, after it was stranded on that same part of the coast in 1914. Beyond these personal narratives, Webb-Ellis’s interest lies in an investigation into the role that photography plays in the obliteration of ‘real’ memory, and how images and objects come to stand for, or take the place of, lived experience. The island in the sea is in fact a scale model of one of the abandoned houses in the Bulgarian village, built onto a rock from the village itself, and carried back over land to the UK. Both invented and real, the house and the island make physical the artist’s childhood fantasy of the place where his mother had gone. The rooms of the house that are seen in the film are fragments of other buildings: a reconstruction. There are many fragments and relatively little time to take them all in. The viewer might ask: why are we being shown this? What does it add up to? What can I identify or recognise? And what will I remember?